Delta Kits (www.deltakits.com) windshield repair and headlight restoration products are used by over 10,000 customers in more than 75 countries. Their industry leading tools, resins, and equipment are preferred by professional windshield repair and headlight restoration technicians worldwide and are highly respected for quality, durability, and ease of use. The Delta Kits team of award winning windshield repair experts has almost 70 years combined experience as educators, technicians, and leaders in the industry — setting a standard of excellence for auto glass repair. 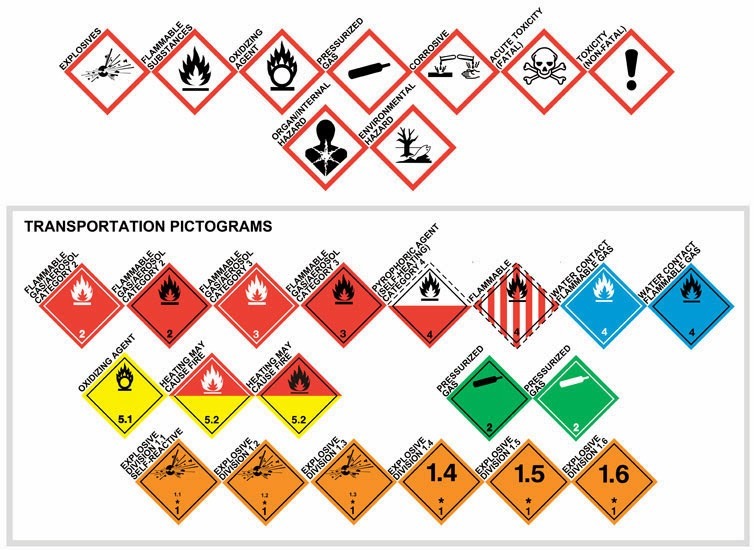 As with most companies in the chemical and adhesive industries, Delta Kits needed to comply with the international Global Harmonized System of Classification and Labeling of Chemicals (GHS) requirements, implemented in the United States by OSHA (https://www.osha.gov/dsg/hazcom/ghs.html) with the deadline date of June, 2015 (December, 2015 for distributors) https://www.osha.gov/dsg/hazcom/HCSFactsheet.html. David Patterson, Warehouse Manager, for Delta Kits contacted us after a referral from one of our other customers. 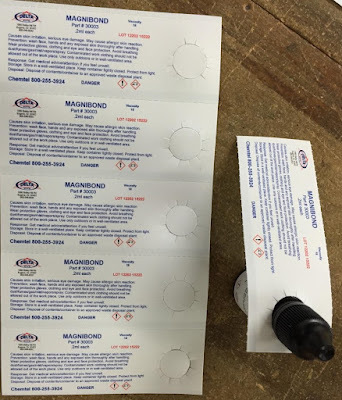 One of the label needs David had was to meet dual language requirements for GHS in Canada especially on small bottles: http://www.deltakits.com/shopping/resins/product/87-30290-premium-pit-resin-7-ml-plastic-bottle or syringes http://www.deltakits.com/shopping/resins/product/81-30003-magnibond-resin-one-shot-applicator-pkg-of-5. 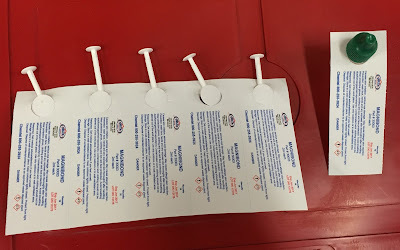 Based on this requirement, David asked, “Does the TM-C3500 printer have the ability to print on card stock like bottle neckers?” David had the idea of placing slits in a necker to enable the tag to slip over a bottle or around a syringe. 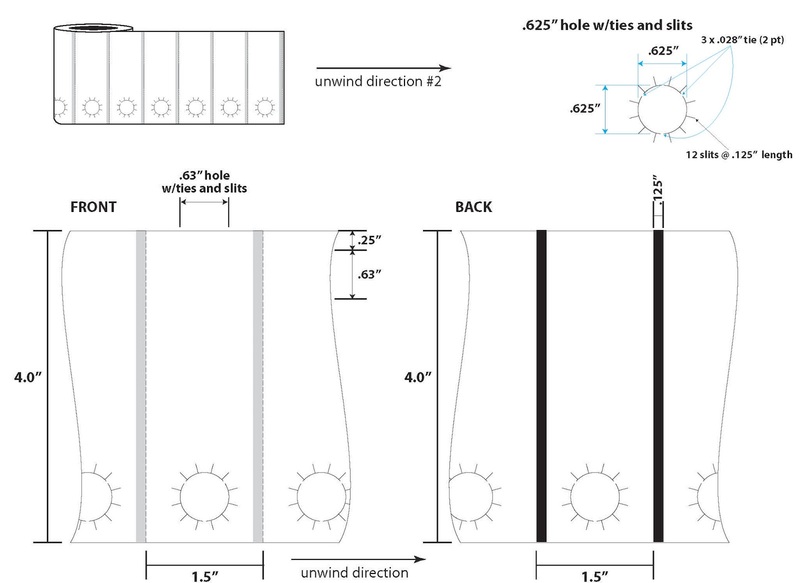 Here is his first draft design of a 4” x 1.5” necker. David’s idea was to use the neckar to add more area for information to meet the GHS requirements for small containers. Plus, he could use the neckars as a means to print in dual languages for shipping; that would make it easy to remove once the product arrived in country. This idea sounded perfect for many of our customers with small containers. We decided to place slits in the hole; and leave the chad. We needed to leave the chad as the C3500 uses a vacuum to hold the paper to the printhead. With a hole, the printer could produce bad print quality or will not work. According to David, the blurred print was worse using a PDF. 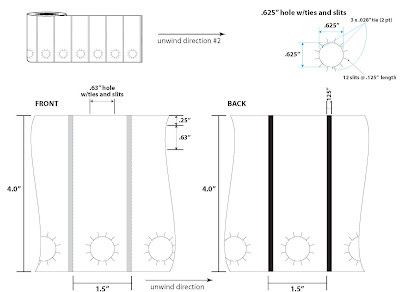 Based on the feedback, we decided the hole was causing the issue; especially given the stiffer matte poly; and opted to try a softer, more conformable material. Once produced, David again tried this material but found a different issue. The tag would not read the black mark and skipped tags; or would not read the blackmark at all. With the new feedback, the plant went to work to determine what was causing the issue. It was soon discovered that the tags would work, no problem, if the tags were rewound in the opposite direction. And now Dave is printing GHS tags that look great! 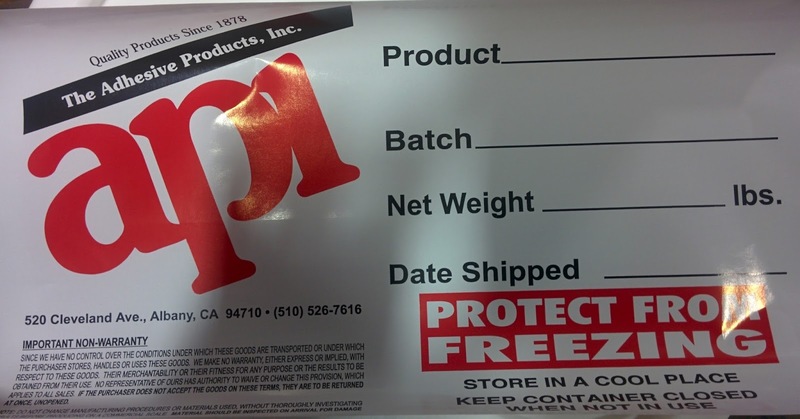 David Patterson of Delta Kits had a great idea to solve the issue of adding a lot of information to labels for very small containers. If you have small bottles or syringes that need to meet the GHS requirements, contact us about using tags or neckars to provide more real estate for information. We can help. For 130 years, Adhesives Products, Inc. (API), http://www.adhesiveproductsinc.com/, has produced high quality products for the adhesive industry including many types of glues, adhesives, tapes, labels and coatings. 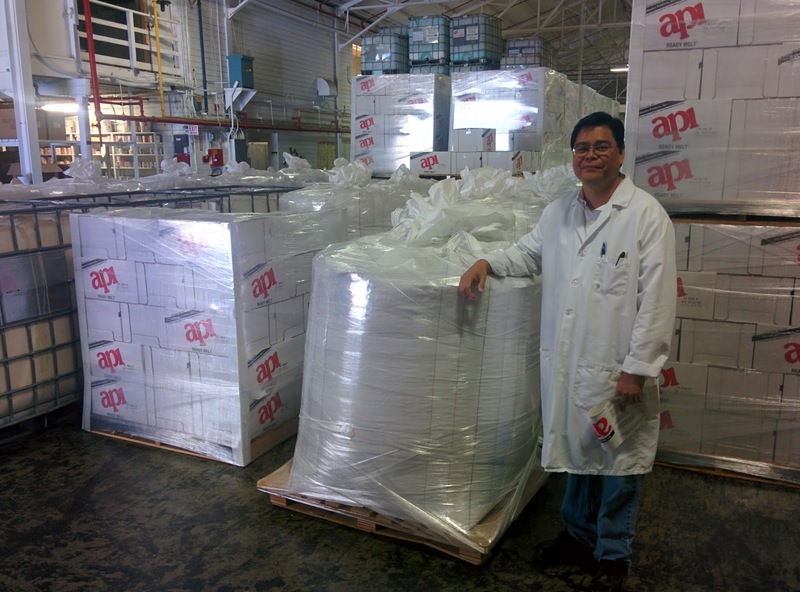 Since 1878, the mission of API remains today to be a highly responsive manufacturer, selling quality products to their customers. 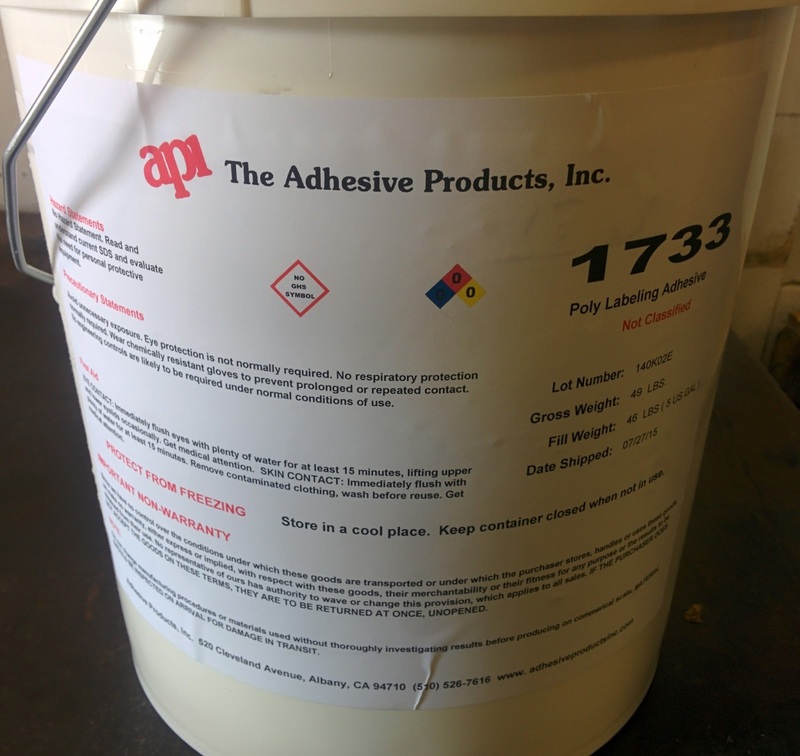 Like all companies selling adhesives, API needed to comply with the GHS requirements prior to June 1, 2015. By this date, Color Label Solutions had 45 posts covering GHS. Our first post from February 2012 covers Oakwood Products and their effort to meet the GHS Requirements: http://colorlabelsondemand.blogspot.com/2012/02/un-drives-print-on-demand-color-label.html. Other early posts included Octochem: http://colorlabelsondemand.blogspot.com/2012/02/chemistry-opportunity.html and GHS in general; http://colorlabelsondemand.blogspot.com/2012/03/what-h-is-ghs-opportunity.html as well as BS5609: http://colorlabelsondemand.blogspot.com/2012/03/bs5609-is-no-bs.html. Based on the requirement to produce drum labels and add data to labels at print time, we recommended BarTender. Based on this recommendation, Jeff visited our post on creating drum labels; including downloading the example template and database we provided. 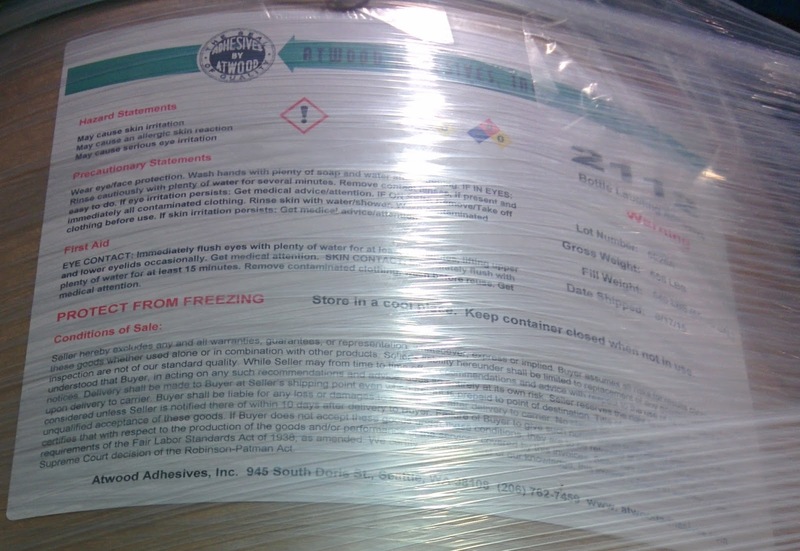 You can see this post here: http://colorlabelsondemand.blogspot.com/2014/09/ghs-drum-label-template-database.html. Based on our discussion, Adhesive Products purchased C831 printers for both their CA and WA locations as well as BarTender. 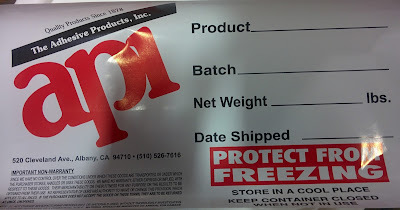 With this software, Jeff created great looking labels, even for their pails. Also, Jeff was able to eliminate the requirement to add information by hand. Now the shipping manager can print, apply and ship product without using a pen! For their labels, Jeff is using matte paper. As they don’t ship internationally via marine, they don’t need to meet the BS5609 requirements. Even so, Jeff has found our paper labels to be relatively durable. It’s great to work with customers like Jeff and API. They understood their requirements, and made decisions decisively. Now they have a GHS label solution that works well for them. If you need a GHS solution or a better option than you are currently using, contact us here at Color Label Solutions. We’ll make sure your path forward quickly and easily and not "sticky" just like API.